The first of Ben Garrido’s three novels about broken identity, The Blackguard follows young engineer Marcus Hunyadi as he tries to separate Nevada’s ancient and isolated town of Enclave from its immense natural resources, protect a child of tainted blood, and attain the power he craves. A fast, minimalist novel filled with cutting irony and dark humor, The Blackguard is a world both alien and uncomfortably familiar. Gripping, unsentimental and disturbing, Garrido’s story will ask how much you really care about your roots. Ben Garrido is the author of the novels The Blackguard and The Potency (available in late 2014), in addition to the upcoming novel The Book of Joshua. 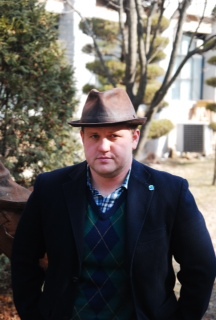 He also writes award-winning journalism for the Reno News and Review, Chico News and Review and others, and lectures on second language acquisition at Mokwon University in South Korea. He writes on subjects including language, fiction, adventure and logic. Raised in Reno, Nevada, he now divides his time between South Korea and the United States.